Cloud-based RapidDeploy technology, a configuration and deployment tool that comes standard with WatchGuard Firebox appliances, enables IT staff to create and store configuration data in the cloud – public or private – and have a new appliance directly shipped to its destination. Once the device arrives, it can connect to the cloud for a secure download of its configuration settings, saving staff travel time and money. This technology is particularly advantageous for large distributed enterprises where managing a multitude of devices efficiently across multiple locations and geographies is critical. Uniquely architected to be the industry’s smartest, fastest, and most effective network security products, WatchGuard solutions deliver in-depth defenses against advanced malware, ransomware, botnets, trojans, viruses, drive-by downloads, data loss, phishing and much more. 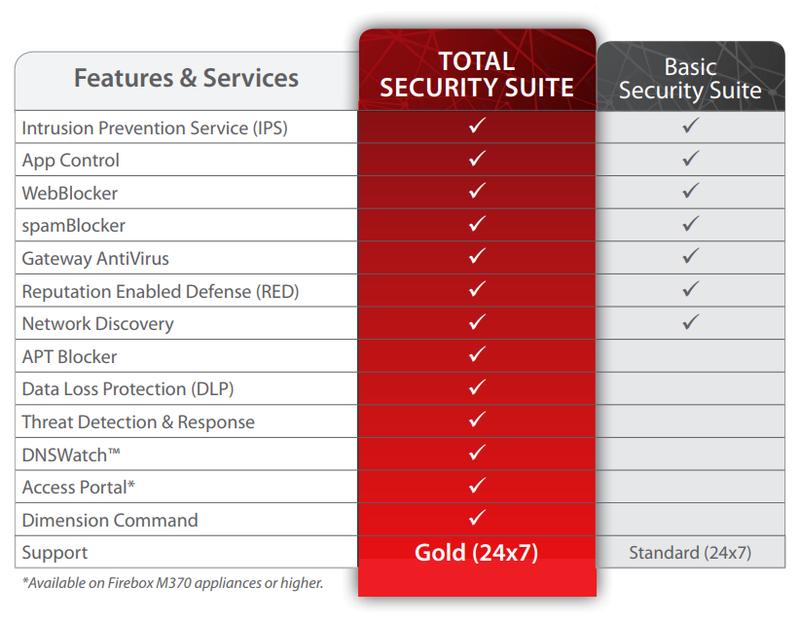 Total and Basic Security Suite packages are available on all Firebox solutions.